This GUESS rhodium plated bracelet features a dainty heart charm with embedded Swarovski® crystal detailing that is sure to garner a delightful response. Presented in a GUESS pouch and gift box. 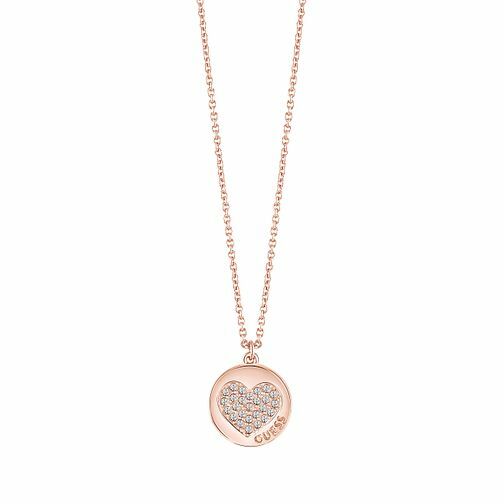 Guess Rose Gold Plated Little Sparkle Heart Pendant Necklace is rated 5.0 out of 5 by 4. Rated 5 out of 5 by Anonymous from Lovely product Very happy with my purchase. Product came exactly as described. Rated 5 out of 5 by Anonymous from So pretty This necklace is so pretty on both sides. This was not shown in the photo so was a lovely surprise. Larger than I thought too. All in all a beautiful piece.